1. 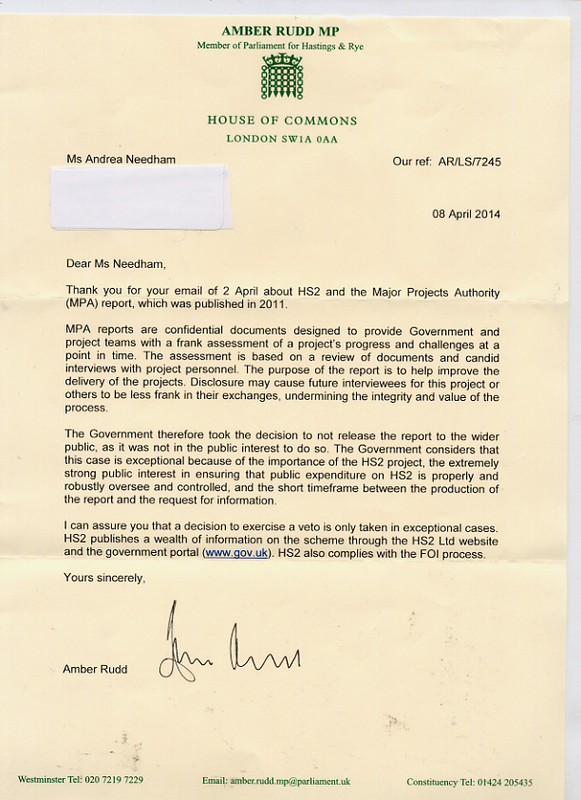 Will you ask Patrick McLoughlin to release the Major Projects Authority report before April 28? The Information Commissioner ruled in June 2013 that it was in the public interest that the November 2011 Major Projects Authority report into HS2 should be released. Patrick McLoughlin then employed rarely-used veto powers to redact it. On 28 April, MPs will be asked to debate and vote on HS2. How can they possibly make an informed judgement on the project when they are not allowed to read a major report about it? It is impossible to believe that the report would have been redacted had it been positive, and the only conclusion one can draw is that it painted a very poor picture of HS2. 2. Do you think it is acceptable for the government to spend £50bn of public money on a project which will increase carbon emissions for at least sixty years? According to the government’s own assessment, HS2 is predicted to increase carbon emissions for at least the first sixty years of operation. Do you think this is a responsible way to proceed at a time when we are facing extreme effects of climate change and there is a critical need to reduce our emissions? 3. Do you think it is acceptable for the government to spend £50bn of public money on a project which, at best, is ‘at the low end of medium’ value for money? According to the government’s own economic review of HS2, the project is likely to be in ‘the lower end of the medium value for money category’. If the predicted benefits don’t materialise, it would come out as ‘low’ value. The DfT’s own guidance to Local Transport Bodies (which were responsible for making decisions on tiny sums of money relative to the £50bn of HS2) is that projects less than ‘high’ VFM should only be funded ‘in exceptional circumstances’. What are the exceptional circumstances in this case? All three questions put to her were ignored. She did not agree to ask Patrick McLoughlin to release the report, and had not a word to say on carbon emissions or value for money. This is simply a pointless, stock response. It is scandalous that MPs will be voting on 28 April on a project which will cost the public a staggering £50bn, as well as causing untold environmental destruction and increasing carbon emissions for sixty years, and Amber Rudd believes it is ‘not in the public interest’ for them to be apprised of the full facts before they vote.